Milwaukee County’s first two courthouses were located east of the Milwaukee River in today’s Cathedral Square. The choice of a west side location on North Ninth Street for a third courthouse was a controversial one, but the land was acquired and the cornerstone laid in 1930. The courthouse serves as the western anchor of the Civic Center which reaches down Kilbourn Avenue to City Hall. The winner of the national architectural competition was Albert Randolph Ross, whose $10 million design features huge Corinthian columns. The Milwaukee County Courthouse which was completed in 1931, houses the county and circuit courts, the offices of the County Executive, Board of Supervisors, Register of Deeds, and many other branches of county government. Congress established the National Asylum for Disabled Volunteer Soldiers in 1865 and decreed that branches of the Asylum be located throughout the country. In Milwaukee, a small home for disabled Civil War soldiers was already open. Its backers helped persuade officials to locate the Northwestern branch of the National Asylum here when they offered to contribute the proceeds from the sale of their facility. Land was purchased in the old Town of Wauwatosa and the first veteran was admitted on May 4, 1867. Early patients were housed in farmhouses until the main building, designed by Edward Townsend Mix, was completed in September, 1867. Additions were made to this structure in 1876 and 1888. The Ward Memorial Theater opened in 1882 and a chapel was built two years later. It was originally expected that the Soldiers’ Home would eventually become a public park, but veterans of later wars also required the facility’s care. In 1930, the U.S. Veterans Administration assumed responsibility for the Soldiers’ Home. Known to Milwaukeeans as “The Domes,” this horticultural conservatory designed by Donald L. Grieb was completed in 1967. The complex conoidal structures consist of triangular, diamond, and hexagonal shaped sections welded together on a pre-cast concrete framework. An outer layer of glass and aluminum ensures maximum sunlight. The domes are 140 feet in diameter and 85 feet high. Widely differing climates are maintained in the Tropical Dome with an 85% relative humidity, and the Arid Dome with a 35% humidity, in which the flora of these areas flourish. Seasonal displays of flowers and trees take place in the Show Dome. Mitchell Park was established in 1889, and the first horticultural conservatory there was built in 1898. More than 350,000 persons visited that site annually until it was razed in 1955. Mrs. Lyndon B. Johnson officially opened the new conservatory as part of her “Keep America Beautiful” campaign. In 2008, while undergoing repair or replacement of glass in the Domes, a special lighting system was installed to highlight the structures at night. Like the Whitefish Bay Armory, the Richards Street Armory was designed by Shorewood architect Henry C. Hengels, who was appointed State Architect for Wisconsin in 1920. The Richards Street Armory was constructed as a replacement for the Shorewood Armory, and both the National Guard infantry and cavalry units were relocated to the new facility in 1929. 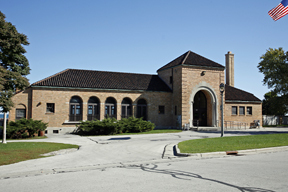 It was recommended for designation as a Milwaukee County Landmark in conjunction with the Whitefish Bay Armory because the two building were believed to be the oldest National Guard facilities in Milwaukee County and, as a result, possessed notable historic significance with regard to the role of the citizen soldier in local, state and national history. Purchased by the First Wisconsin National Bank in 1928, a long tradition of banking service continued in this “temple of commerce” for another 37 years. In 1965, the bank turned the building over to Milwaukee County specifically for use by the Milwaukee County Historical Society as a center for the study of local history and a headquarters for the activities of the Society. The building’s architecture is in the French Renaissance style. The entire interior finish is black and white Paranozzo Italian marble. There are six massive vaults located in the basement, main floor and mezzanine levels of the building that never fail to generate awe and amazement. The one located in the south end of the building has a door and vestibule weighing 27 ½ tons, while the door and frame of the safe deposit vault in the basement weighs 42 ½ tons. The total cost of the structure was $400,000, a very substantial amount for that time. The largest single expenditure of $75,000 was for the doors, frames and other fixtures for the six vaults. Over 600 pilings, each a foot in diameter, were needed to carry the immense weight of this huge building. In addition to being a City of Milwaukee and Milwaukee County Landmark, the Milwaukee County Historical Center has also been listed on the prestigious National Register of Historic Places. Famed Finnish architect Eero Saarinen designed the building with Maynard Meyer of Milwaukee as associate architect. Saarinen’s unique design for a floating cruciform with cantilevered portions created excitement in the community, and is now considered a classic in the development of modern architecture. The building was designed so that its lower portion would provide room for exhibitions and classes. Construction began in 1955 and the building opened in 1957 when the Milwaukee Art Institute and Layton Art Gallery merged their collections and projects to form the Milwaukee Art Center. A tiled mosaic was also added to the building façade that year. Designed by Wisconsin artist Edmund Lewandowski, its intricate pattern of Roman numerals commemorates the years of World War II and the Korean War. In the late 1960s, Peg Bradley, wife of Harry Lynde Bradley who co-founded the Allen-Bradley Company, offered her entire collection of more than 600 modern American and European artworks to the Museum. She also made a $1 million challenge to the people of Milwaukee for an addition to the Art Center. By 1970, this challenge was more than met. $7 million was raised and plans were drawn by architects Kahler Fitzhugh Scott of Milwaukee. In 1975, the new addition, including the Bradley Galleries, was opened. It houses much of the Museum’s collection and changing exhibition galleries. The Museum also added amenities such as a theater, educational center and a small restaurant. A post-modern addition, designed by Spanish Santiago Calatrava, was completed in 2001. One of the first five sites purchased by the Milwaukee Board of Park Commissioners in 1890, River Park – as it was originally called – was described as “a picturesque little tract cuddled down in the valley of the Milwaukee River above the dam, its location such that ample opportunities for boating in the summer and skating in the winter are afforded.” Along with Lake Park and Washington Park, Riverside Park benefited from the skills of landscape architect Frederick Law Olmsted, who designed New York City’s Central Park and who was hired by the Park Board to provide similar services for Milwaukee. Although Riverside Park was originally divided in two by the Chicago and Northwestern Railroad tracks, a culvert beneath the railroad right-of-way provided safe passage from one section of the park to the other for visitors. The park was officially named Riverside Park by the Milwaukee Board of Park Commissioners in 1900. The property was designated for its historic significance. One of Milwaukee ’s newest businesses has taken one of the city’s oldest buildings, the Milwaukee River Flushing Station, and created a coffee shop. The Flushing Station, built in 1888 and home to a water pump that was once the largest in the world, is now occupied by the Alterra Coffee House on the Lakefront which opened in September 2002. The product of a partnership between Alterra Coffee Roasters and the Milwaukee Metropolitan Sewerage District (MMSD), the coffee shop offers gourmet coffee, pastries, and meals in a building that has already won preservation awards from the American Society of Mechanical Engineers and from the Milwaukee Historic Preservation Commission. The design includes an “education center” with displays on storm water runoff and pollution, as well as a model of the deep tunnel system administered by the MMSD. The delightful combination of a modern coffee shop with a century-plus old building shows the commercial adaptation of a historic building at its best. The Villa was designed and built for Mr. and Mrs. Lloyd R. Smith by David Adler in 1923. David Adler, a native of Milwaukee, who studied architecture at the Ecole des Beaux Arts in Paris, is known for his home restoration projects. Balance and symmetry are seen throughout the home and garden. The cloistered court features slating and an intricate mosaic of black and white pebbles from nearby Lake Michigan. Many aspects of the Villa are reminiscent of 16th century Italian villas, including the Italian barrel tiled roof and the whitewashed warm pink brick exterior walls, which were quarried and carved in Italy. A vaulted veranda is supported by simple Tuscan columns. Italian grilled windows and an intricately patterned brick pavement lead to the front entrance. The entrance hall has a circular stairway with no central support in the traditional 16th century Italian manner. Milwaukee’s Cyril Colnik’s elaborate wrought- iron stair railings and entrance gates show his superb skills as a craftsman. The great hall has a stenciled beam ceiling of Georgian cypress. The Renaissance Garden, an official project of “Save America’s Treasures” has been open since 2002. The house was deeded by the family to Milwaukee County in 1966 for use as a decorative arts museum. The mansion also houses an art reference library. This museum was originally the home of Charles Allis, the former president of Allis-Chalmers Corporation. He and his wife Sarah amassed a unique art collection which they housed in this Tudor-style mansion. Designed by Alexander Eschweiler and completed in 1911, it is a rare intact example of a high-style Milwaukee mansion of the Edwardian period. Eschweiler was Milwaukee’s premier architect of the first quarter of the 20th century. He was educated at Cornell University and designed numerous mansions in the North Point Historic District, North Lake Drive and many country houses. The simplified Tudor style is characteristic of Eschweiler’s work utilizing red brick with simple decorative details. 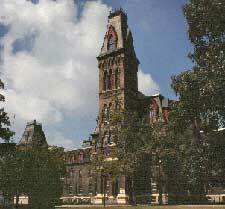 In 1998, the community enhanced the Allis gift by contributing $1.4 million for the construction of the Margaret Rahill Great Hall. Designed by Uihlein/Wilson Architects, the Great Hall triples the space available for Museum programming, community use and private rentals. The bulk of the lavish interior has been meticulously preserved and includes examples of Louis Comfort Tiffany glass, hand-tooled wallpaper and ornate marble and plaster work. The mansion was bequeathed to the public with its original furnishings and art collection. The permanent collection includes nineteenth-century French and American paintings, Chinese and Japanese porcelains, Renaissance bronzes and much more. Highlights include pieces by Rosa Bonheur, Winslow Homer and several French Barbizon works. The museum is a rich cultural institution serving the community though exhibits and programs. The North Point Lighthouse was originally built in 1855. The lighthouse was rebuilt due to shore erosion in 1888 and raised to reach above the tree line in 1912. The North Point Light played an important role in Milwaukee’s maritime trade for over 120 years, remaining in use until decommissioned in 1994. The 74-foot tower has been listed on the National Register of Historic Places since 1984 and on the Register of Historic Lighthouses since 1980. The North Point Lighthouse Friends finished restoring both the lighthouse and the keeper’s quarters in 2007. The property was designated for its historic and architectural significance. The Bradford Beach Bathhouse was designed by Milwaukee County Architect Gilbert Grunwald and constructed in 1950 at a total cost of approximately $255,000. The building represents an excellent example of the Art Moderne style popular during the Post-World War II period. The property was designated for its architectural significance. In 1889, the City of Milwaukee created its first Park Commission under the presidency of Christian Wahl. The Commission hired eminent landscape architect Frederick Law Olmsted, designer of New York’s Central Park, to develop plans for three local parks: Lake Park, River Park (now known as Riverside Park), and West Park (now known as Washington Park), plus Newberry Boulevard, to connect Lake and River Parks. Of the three parks, Lake Park most closely retains the original form and intent of its designer. It also houses one of only two extant Indian mounds in Milwaukee County. Lake Park was entered on the National Register of Historic Places in 1993. The property was designated for its historic and architectural significance. The South Shore Park Pavilion was designed by the Milwaukee architectural firm of Clas & Clas and completed in 1933. Like many other buildings in the Milwaukee County Parks System, it was constructed with relief labor made available through Depression-era programs of the federal government. It replaced an earlier bathhouse constructed in 1912 at the same location on the shore of Lake Michigan in the Bay View neighborhood. The property was designated for its historic significance. 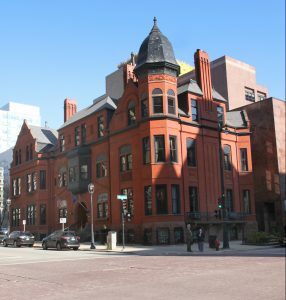 Located on the northeast corner of North Jefferson Street and East Wisconsin Avenue, this Victorian Queen Anne style building was designed by famed architect Edward Townsend Mix in 1883. 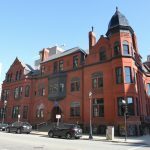 The history of the Milwaukee Club began in January 1882 when a group of local businessmen organized what became one of Milwaukee’s oldest and most exclusive social clubs. Its first meeting was held in the ill-fated Newhall House Hotel on March 6. By this time, 115 of the city’s most prominent citizens had subscribed, and they elected Alexander Mitchell as the club’s first president. After the Newhall House was destroyed in a fire, the Milwaukee Club hired Mix to design their new clubhouse. The red brick structure was constructed at a cost of nearly $90,000. The club’s early membership was a “who’s who” of Milwaukee society, including such prominent families as Pfister, Wells, Pabst, Layton, Fitch, Layton, Plankinton and Uihlein.